For those of you who have always hoped The White Stripes would get a proper rhythm section, your wish has finally come true. 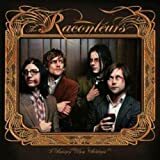 Enter The Raconteurs: a collaboration between Jack White, Brendan Benson, and the rhythm section of the Detroit band The Greenhornes (Jack Lawrence and Patrick Keeler). The album starts off strong with the first single "Steady, As She Goes". I have to admit, I cannot get enough of this song. It reminds me of the type of alternative rock anthem that you would have heard on the radio in the early 1990s. The entire album continues with bluesy rock and Beatlesesque pop that's sure to please White Stripes fans and anyone else who gives it a chance.